First of all, I want to tell you I’m proud of you — both of who you are now and of the person we’ve become. You are capable of so much more than you give yourself credit for, and the confidence we have within us now is something I wish we’d learned earlier. I know accepting the fact that you have spina bifida is difficult right now. You only seem to notice your differences, and you see them as weaknesses. But I want to tell you that your disability isn’t a limit — right now, in this moment, it’s the thing giving you the wings to fly to places you never thought you’d get to go. You were given a more difficult life, as you’re well aware of by now, but that life has given you so much strength. I’m just now realizing how amazingly tough we were at the age you are, and how tough we still are. I also want to tell you that no matter what you convince yourself to believe, and no matter how much guilt you feel when you think you’re not handling your life well enough, you’re handling it the best way you can. The journey toward accepting and loving your disability will start with accepting one simple fact: You wouldn’t be the same person you are now had you not been born with a disability. And that would be a shame, because honestly, I love and am proud of the person I am. Living with a disability has taught me how to be a person who says, “Oh, you don’t think I can do this? Watch me do it — and do it very well!” That mindset is something many people try to achieve — we were born with it. Keep proving to people that spina bifida is not the most important thing about you, because it isn’t. It’s a big part of you, it made you who you are currently and who we are now, but it isn’t the only thing that led us here. Having a disability shaped you just as much as being determined to act like you don’t have one did — it made us independent. Use your disability to help yourself when it can, because you might as well make the best out of a situation that isn’t ideal. Your disability can bring you so much opportunity — in fact, your dreams are coming true right this second, but that doesn’t mean we’re done dreaming. Don’t stop trying to be the person you want to be. When you wake up and realize you’ve become that person, try to become even better. I’m not going to tell you to try harder in school, because you aren’t going to listen to that anyway, but I want to tell you this — keep writing. You have an overwhelming feeling that this is what you’re meant to do, and you feel that way because it is. Please realize that sooner. Plus you have even more to look forward to, like meeting friends who really “get you.” You’ll feel loved beyond all comprehension. I know you feel loved now anyway, and I can’t really explain it to you, but it just feels so different now. You’ll come so close to accomplishing your dreams, and you’ll keep getting closer. Today you love your disability for teaching you all of these things. You love your disability because, though sometimes it’s difficult, it’s an important part of who we are. Here we are, living and thriving and loving our life for everything it is. This frustrating, stressful, wonderful life is everything I could want my life to be. I can’t wait for you to be able to experience it all. Carrie McLeod is a 23-year-old full-time college student currently majoring in Special Education at Missouri State University. 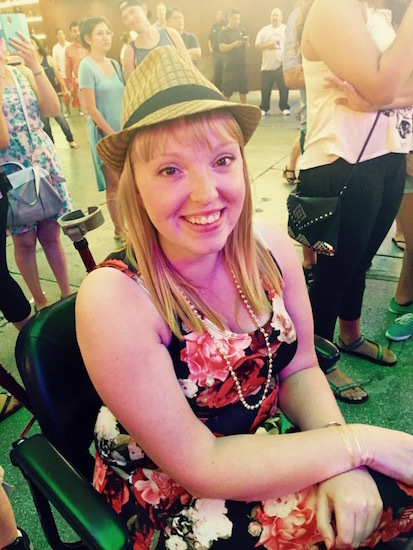 She of course enjoys writing and through her writing hopes to raise awareness of Spina Bifida and disability-related topics and issues. She also hopes that her writings inspire others to pursue their dreams.